A few days ago I saw an excellent example of collaborative marketing: the video for the song “Really like you” by Carly Rae Jepsen. 2 Who gained in this case from collaborative marketing? 3 Are you ready to have your own website? 3.1 Contact us right now! 6 Are you ready to have your own website? 6.1 Contact us right now! Carly Rae Jepsen is a young Canadian girl who sings pop music for teenagers. It has had considerable success among this audience since her debut. The video has become so important that both ABC News and Time magazine have dedicated an article. Moreover, it has its own page on Wikipedia. It’s so funny to see Hanks lip sync to Carly, even more with unrelated images. For anyone who is a fan of Hanks surely it was really funny to see him in that video. Surely, those who follow his film career remember that his beginnings were as a comedian. And most likely, for many Tom Hanks fans, that would be their first contact with Jepsen. From there to becoming a fan is just a step. In fact, in the following days I saw and heard the song several times, and even recommended to some close friends to watch the video. It’s clear that I became a fan of Jepsen, although I’m not her target audience. Who gained in this case from collaborative marketing? Jepsen was not the only beneficiary in this adventure. Although Tom Hanks is a cinematic legend, being the only actor who has won 2 consecutive Oscars, his fame is mainly in the 90s. 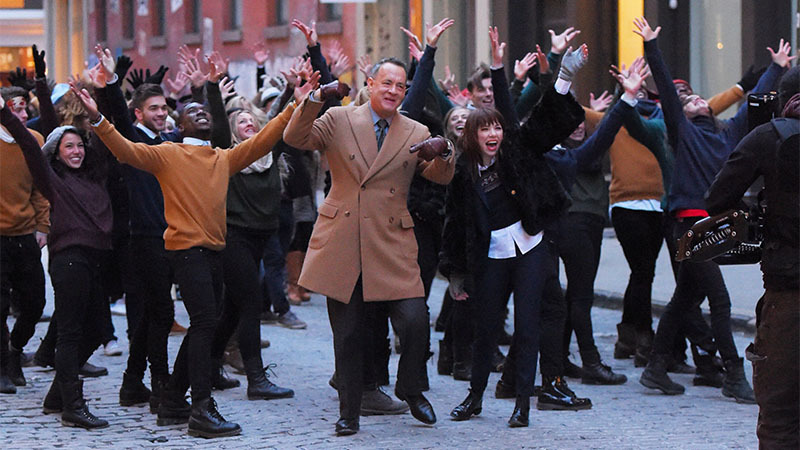 In fact, the idea to participate in the video of Carly Rae Jepsen came from Tom Hanks. At a dinner with the producer of Jepsen, he told the idea of ​​the video. Hanks volunteered to play the part. Some of the most important films he has done so far, such as “Philadelphia“, “Forrest Gump” and “Castaway” were from the mid to late 1990s. Perhaps some of the fans of Jepsen had never seen a movie of Hanks, due to the age difference. But they may be more willing to see any of the next ones he does, after having seen it in the video of the singer they like. Any artist, whatever his/her art, to stay top-of-mind in people, must keep working. In spite of that, it is normal that over time, fame decays, perhaps completely. This is the world of entertainment, but the commercial world works the same way. Well, the protagonists then told how they made this video. How it was done is summed up in this video. Now, what made people so different and with such different target audiences, joined in this same project, the making of this video? Well, actually if they were not so different, it would not work. The idea of ​​collaborative marketing is to offer different audiences the same product. Another option of collaborative marketing is to offer the same audience different options. Most of Jepsen’s fans are teenagers, while Hanks’s are already adults, perhaps even middle or senior. So Carly could get some fans among the adult audience and Hanks some among the teen audience. This collaborative marketing experience is great, but you should definitely be thinking about how you can do something similar. In fact, if this article did not talk about it, it would be incomplete, certainly. Well, the first thing is to define well the niche you are targeting, and then define other possible markets that might interest you. Let me give some examples. A company that sells welding machines is surely targeted at metalworking, automotive and oil companies. Perhaps the same is the market of a company that sells industrial cleaning systems. If both companies partnered in, for example, events, they could expose both their products, obtaining the greatest benefit and dividing the expenses. Another option is to exchange information about clients, seasons, etc. But let’s look at another example. Suppose you run a party room. Well, those who organize parties would be your first customers. But more than seeing them as customers, they can become partners if you see the opportunity to make a collaborative marketing. For example, a customer may come to rent the room, but there is no one yet to organize the event. Well, you could have a selection of party planners, or perhaps one in particular, whom you could recommend to these clients. In turn, this party planner could commit to using your room whenever possible. Although making events, sharing information and the other options we have talked about are fine, we still have to explain one that is much better. I mean the links between websites. That is precisely the origin of Google: determine the importance of a website according to how many other websites quote it or link it. So, a great idea would be that the websites of companies that can be allied, have a link to the website of your company. In turn, you could return the favor by making a link from your website to theirs. Although the link could be in a menu, perhaps called “Related Companies”, it is best to be contextual, that is, to be part of a text. For example, on the page about the company you could have the logos of the companies with which you have agreements, along with a link that leads to your website. Or perhaps in the description of a product you can indicate that the additional accessories are manufactured or distributed by your partner company, and place a link there. This type of collaboration is important because it can be permanent, while the link is online. In addition, they have long-term benefits, from the point of view of search engines. No matter the size of your business, there are always others around who also address your niche, or another you want to reach, with which you can do a collaborative marketing. At the end of the video Really like you, you can see an additional collaboration: Justin Bieber joins in the last section of the video, to participate in the final dance choreography. Certainly this video was not a coincidence, but was the result of a collaborative marketing very well thought out. Similarly, if you want to work on your case, you have to think very well, perhaps making a list of pros and cons. You may want to make a list of these factors and think carefully about what a collaboration would mean now and in the future. But all this previous work can result in great long-term results. That’s why I encourage you to immediately start looking for opportunities to do collaborative marketing. Have you already done it? How was your experience? What do you think of collaborative marketing? I’d love to read your comments.